The negative point totals (minus-39, minus-38, etc.) from which golfers start in the Chicago format. The Chicago golf format, which can be played as a tournament or as a betting game within a single group of golfers, starts each golfer with a negative amount of points, then awards points for positive achievements during the round. The object is to move from negative points into positive points (known as "clearing your hurdle") and the golfer (or team) who gets farthest into positive territory is the winner. The Chicago format, because its negative points start at 39, is also known as 39s or Thirty-Nines. And it is very similar to, but not identical to, the format called a Quota Tournament. Continue in this fashion until you reach the 36-handicappers, who start with minus-3 points. All golfers with handicaps at 36 and above begin at -3. Not everyone will be able to clear their hurdle (move into positive points), but many will. 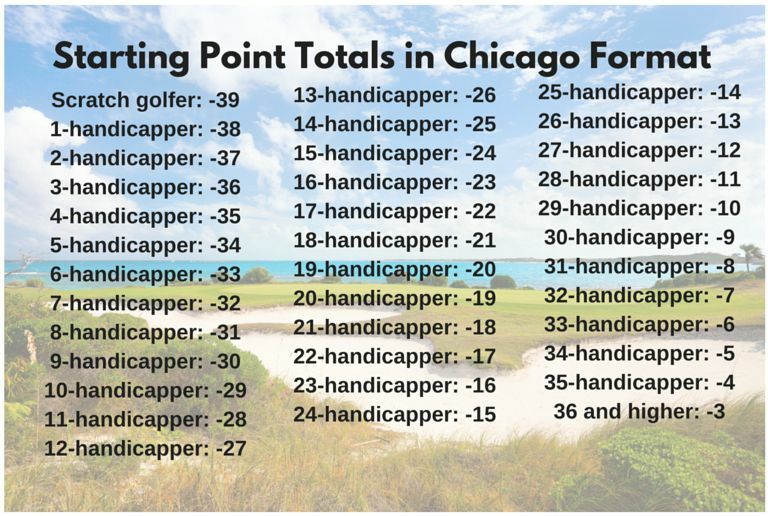 The golfer with the highest point total once everyone has completely play wins a Chicago tournament for golfers competing as individuals. If the Chicago tournament is team vs. team (rather than individual vs. the field), the team members add up their starting negative points to create a single team starting point. The object is then the same: clear the hurdle (move into positive points) by the largest amount. 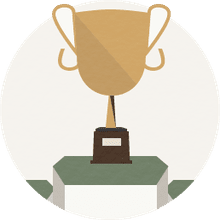 One twist you sometimes see is that if any member of a team remains in negative points at the end of the round, those points are subtracted from the team total. That puts the onus on every team member to clear his or her hurdle. For example, if three golfers on a team combined for 22 points, but the fourth member finished with minus-3, then the team total is 19 rather than 22. Each golfer puts the same amount of money into the pot, then the pot is divvied up afterward as agreed upon before the start of the round. Or you can make each positive point the golfers hold at the end of the round worth a set amount, and pay out the differences. Of course, you can also just do winner-takes-all, with each of the losers paying the winner the bet amount.